Sadly, we can’t presently spend an evening with C.S. Lewis . . . but what’s the next best thing? A week ago my wife and I joined some dear friends at the Seattle performance of C.S. Lewis Onstage: The Most Reluctant Convert. It was riveting. The presentation used Lewis’ own words—from a variety of his works beyond his autobiography—to explain his extraordinary faith pilgrimage. Lewis of course began as a simple, trusting child. Events and educational influences caused him to reject that youthful faith. For many years he was an outspoken atheist. As God drew Lewis closer to himself, the future author of the Narnian Chronicles resisted fiercely. Eventually he surrendered to the evidence that there most certainly was some creative force. This did not make him a Christian, of course. It was merely a conversion to Theism. Max McLean himself, founder of the Fellowship for Performing Arts, does an outstanding job as Lewis. The production team is also superb. The proverbial icing on the cake comes with an informal discussion following the performance. McLean takes a seat on the stage and fields questions from the audience. Coincidentally, the previous performance location was in Berkeley, where they made the tickets so inexpensive for students that they comprised at least half the audience. McLean’s description of the play’s reception and the serious conversation which followed, was fascinating. The Fellowship for Performing Arts is based in New York City, but fortunately tours each year. I have written in the past about their insightful performance of The Great Divorce, which happens to be my personal favorite among Lewis’ amazing corpus. I strongly encourage you to check out their future dates and locations across the country. Some venues will be treated to The Screwtape Letters this season. In writing this piece, the question that came to mind was—what would Lewis have thought about having his life brought to the stage. Obviously, he was quite open and vulnerable in sharing his life with others. He made no pretense to holiness, beyond that which he received by grace as a child of God. Still, having one’s words read is quite different than having yourself portrayed on stage or film. I suspect Lewis would have felt uncomfortable with the latter, and preferred that we stick to literary avenues for learning about him. Lady E. was my mother’s first cousin and perhaps my mother’s dearest friend, and it was no doubt for my mother’s sake that she took upon herself the heroic work of civilizing my brother and me. We had a standing invitation to lunch at Mountbracken whenever we were at home; to this, almost entirely, we owe it that we did not grow up savages. The debt is not only to Lady E. (“Cousin Mary”) but to her whole family; walks, motor drives (in those days an exciting novelty), picnics, and invitations to the theater were showered on us, year after year, with a kindness which our rawness, our noise, and our unpunctuality never seemed to weary. We were at home there almost as much as in our own house, but with this great difference, that a certain standard of manners had to be kept up. Whatever I know (it is not much) of courtesy and savoir faire I learned at Mountbracken. For those who wish to consider more deeply the relationship between C.S. Lewis and the theater, I recommend “Faithful Imagination in Theater.” The author admits that “quality theatre presented from a Christian perspective is hard to find,” but offers hope from Lewis. The article concludes with a worthy challenge. There is a great need for more imaginative engagement with “mere Christianity” in theatre. So let’s get to it. Watching the series House of Cards is not a “guilty pleasure.” It is often a painful exercise in examining just how corrupting, dehumanizing and (ultimately) damning political power can be. The depth of the viewers’ discomfort is a tribute to the perfectly pitched acting and writing. It’s set in Washington D.C., and I am afraid it is more accurate portrait of that dark political environ than anyone but Mephistopheles could imagine. Political corruption is not an American problem. It’s a human condition. Sadly, the perversions of power are replicated in capitals around the globe. House of Cards examines the rise of a particularly evil pair, President Francis Underwood and his wife Claire. * They will stop at nothing—literally, nothing—to sate their shared hunger for power. President Underwood is so self-consumed that few viewers will identify with his dead soul. On the other hand, he is in many ways an attractive, witty and “charismatic” man. This, of course, is the whitewash over the sepulcher that has allowed his rise to the heights of human dominance. Despite his moral decay, there are elements of his behavior with which many can relate. I am not referring to his devotion to his wife, which appears noble but is actually a twisted symbiosis. One way we see how a human being with the potential for true greatness has fallen to such depths comes in small sins. The ones that many of us commit without wasting a “second thought.” Such compromises often lead, as we know from personal experience, to greater transgressions. Too often, our fall begins with a lie. We see a glimmer of this in the following scene. ** The president has enlisted a popular writer to pen his “autobiography.” The author chooses to open the book with a dramatic story about Underwood’s courage and willingness to risk all for a cause. He relates a story from the president’s youth in South Carolina. He stunned his peers by his commitment to swim all the way out to the famous Fort Sumter, at the mouth of Charleston Harbor. He did not make it the first time, and needed to be rescued by the Coast Guard. However, he tried and tried again, until he defeated the tides and waves, and rose triumphant on the island’s shore. I never tried to swim to Fort Sumter. Thomas probably knows I made it up. But he wrote it anyway because he understands the greater truth. Imagination is its own form of courage. This passage is powerful. It not only displays the impulse for self-aggrandizement to which many powerful people are disposed. It also seeks to justify that compromise with integrity, by transforming the very flaw into a virtue! “Imagination is its own form of courage.” True, but given the context, repugnant. And that sort of perversion, which had to have seemed a discordant rationale when he originally voiced it, becomes a rule for his life. I can make up any lie that serves my purpose, because the very act of creating that new “truth” is heroic in itself. In essence, the ends (my accumulation of power), will forever justify the means. The following passages suggest that when we tell ourselves the lie—that existence is ultimately about us—we are destined for disappointment. This is the tragedy being staged before our lives in the television series we have been discussing. It can be summarized in the scriptural maxim familiar even to those who never read a Bible: “For what will it profit a man if he gains the whole world and forfeits his soul?” (Matthew 16:26, ESV). [Humanity] fell. Someone or something whispered that they could become as gods—that they could cease directing their lives to their Creator and taking all their delights as uncovenanted mercies, as ‘accidents’ (in the logical sense) which arose in the course of a life directed not to those delights but to the adoration of God. But that means to live a lie, for our souls are not, in fact, our own. They wanted some corner in the universe of which they could say to God, ‘This is our business, not yours.’ But there is no such corner. They wanted to be nouns, but they were, and eternally must be, mere adjectives. I have begun with the conception of Hell as a positive retributive punishment inflicted by God because that is the form in which the doctrine is most repellent, and I wished to tackle the strongest objection. But, of course, though Our Lord often speaks of Hell as a sentence inflicted by a tribunal, He also says elsewhere that the judgement consists in the very fact that men prefer darkness to light, and that not He, but His ‘word,’ judges men. Our imaginary egoist has tried to turn everything he meets into a province or appendage of the self. The taste for the other, that is, the very capacity for enjoying good, is quenched in him except in so far as his body still draws him into some rudimentary contact with an outer world. Death removes this last contact. He has his wish—to lie wholly in the self and to make the best of what he finds there. And what he finds there is Hell. Lewis’ description of his “imaginary egoist” ably fits the fictional President Underwood and his First Lady. Their lives are consumed by self. The fiction derives its power from the reality. The Underwoods are not simple cartoons. They reveal the life choices of real people in our world. 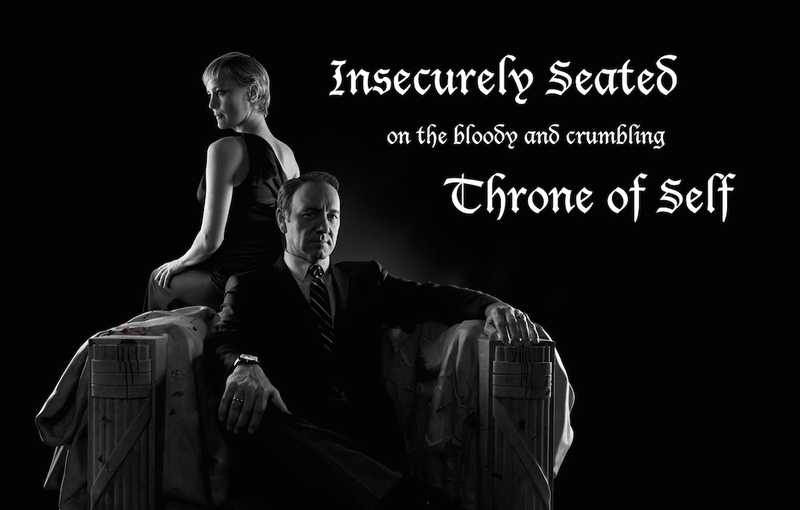 Men and women who have clawed their way onto the throne in their lives, find in the end, that it crumbles beneath them. Only a miracle can rescue them from their terrible chosen destinies . . . and gloriously, that redeeming miracle awaits their cry for mercy, so long as they have breath. * Kevin Spacey and Robin Wright play their tragic characters so well that both have won Golden Globe awards and a variety of other accolades. ** From “Chapter 34,” season three, episode four. *** An “aside” is a device where a character speaks directly to the audience, revealing some private thought or knowledge. It can easily be overused, but is quite finely tuned in this series. The writers of House of Cards are definitely talented.